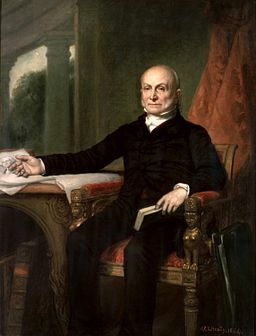 Though he was the first son of a former president to be elected, John Quincy Adams’ presidency was undermined before he even got into office. The 1824 election was crowded with four Republican candidates: Andrew Jackson, Adams, Henry Clay, and William Crawford. Jackson and Adams received the most votes but neither won outright, so the election results were decided in the House of Representatives where Clay was Speaker of the House. Clay threw his support behind Adams. Afterwards, Adams named Clay as his secretary of state. Jackson supporters claimed without proof that Adams had bribed Clay and did their best to discredit Adams. Adams had also inherited his father John Adams’ stubborn refusal to negotiate. His first annual message to Congress contained some good ideas, such as promotion of internal improvements and the creation of a national university. His insistence on broad federal powers and his assertion that government officials did not need to consider the opinions of their constituents made him very unpopular, however. As a result, Congress ignored President Adams’ domestic and foreign policies. After being voted out of office and replaced by Andrew Jackson, Adams did not retire. Instead, he served as a member of the House of Representatives for 17 years. He was the only president to serve in the House after being president. His family objected to him serving in a lower office, but his election pleased him. Nicknamed “Old Man Eloquent” for his speeches against slavery, Adams received more respect in the House than as president. He also accomplished more. For example, he helped repeal the gag rule that prevented the House from debating any criticisms of slavery.